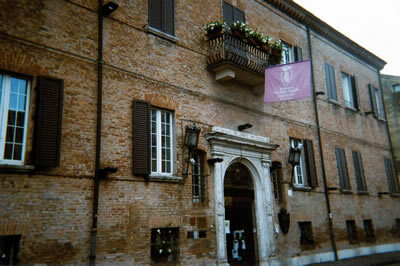 The Duhessa Isabella is a famous hotel in one of Italy’s most beautiful cities, Ferrara. It inhabits a Renaissance palace built around 1500, and is a five minute taxi ride from the Cathedral, an edifice which possesses a sumptuous Romanesque façade, an 18th Century interior and a row of shops along its southern outer wall. 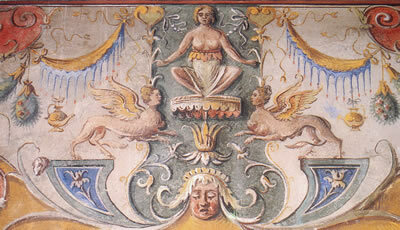 This is a town which likes the unusual, and the Duchessa Isabella has its unusual moments, for it was furnished by those who clearly had no truck with the minimalist school of interior decoration. At no other hotel, for example, have I been blessed with a pink frilly shower curtain. Some of the décor might be in need of a spot of refreshment, but the overall effect of all the paintings, the gilt, the ornaments, the trompe l’oeil and the lace doilies is to create an atmosphere of sumptuous, if faded, luxury. I liked it. Have stowed my hire car in the hotel’s private driveway (an important facility, for the town fathers are keen on parking restrictions), I went through the impressive street entrance and found myself facing a fine marble staircase, leading up to the piano nobile. But my room was on the second floor, so I committed my ascent to the lift. There are 21 rooms and 6 suites here, all different. And – for those of you who like your physical pampering – there is a spa and leisure centre. 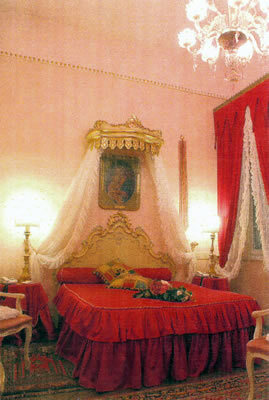 ‘Rosa Bianca’ – for that was the name of my Junior Suite (418€ a night, bed and breakfast for two) – was an essay in pink. Even the marble of the fireplace was pink, and I have already told you about the shower curtain. In the proper hallway were some coat hooks, which were useful for my panama, and the door to the tiled bathroom – wherein I found two wash basins, a bidet, the loo and a bath with the shower over it. 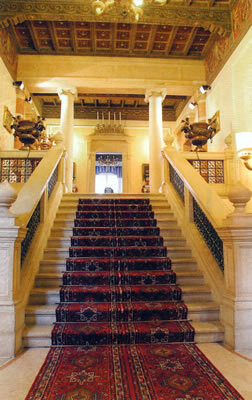 A second door opened into the bed-sitting room, a handsome and spacious chamber, measuring about 20 feet by 16 feet. There was plenty of room for two sofas upholstered in striped, dark pink damask. Good Persian rugs and a six-light chandelier of Murano crystal added to the style. 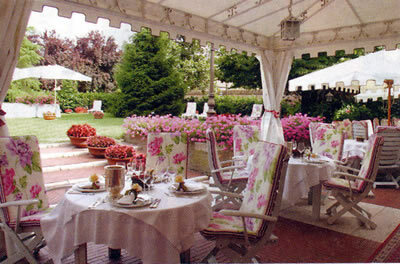 I pulled up the frilly net curtains at the windows to reveal a pleasant view over the hotel garden. The air conditioning was effective and attached to the television was a Sky box, which meant I could listen to some decent tunes on the Swiss Classic Music channel. Above my bed was a painted reproduction of the famous Madonna & Child by Raphael. This was comfortable, pink accommodation. I found another pink room in the morning. 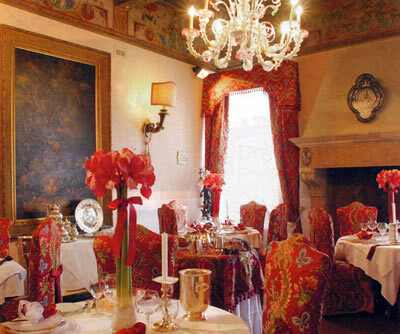 Breakfast was served in the bar, a lusciously roseate chamber, with a massive stone fireplace, more Murano crystal and more Persian carpets. Perched on an elegant fauteuil of blue and red, I observed that the (paper) napkins were pink. Thus installed, I tucked in with great enthusiasm to the delicious warm croissants (brought by the waiter) and the comestibles from the buffet: lovely custard apple tart, fruit salad, rolls, marmalade and grilled vegetables. For dinner I sat on the terrace, looking out over the garden. Before me was cream napery and Bormioli glassware. The food at the Duchessa Isabella is straightforward and decently done. A four course menu is offered for 60€. My three courses were 46€. My pasta – cappelletti in capon and beef broth – was tasty and slightly al dente. My beef tenderloin came with a dense sauce of balsamic vinegar and some good roast potatoes and sautéed onions. And my pudding was a crisp wafer with ice cream and fresh fruit. The wine list has 59 offerings – all Italian, except the champagnes. Prices run from 18€ for a local white to 120€ for a 2003 Amarone from the Veneto (Valpolicella, Bertani). I tried the house red, a round and fruity 2013 sangiovese made by Cantine Braschi (20€). 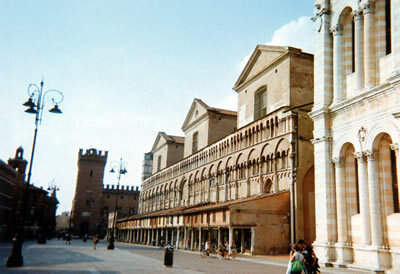 Ferrara is a city well worth a visit. The Hotel Duchessa Isabella awaits. Via Palestro 70, 44100 Ferrara, Italy.